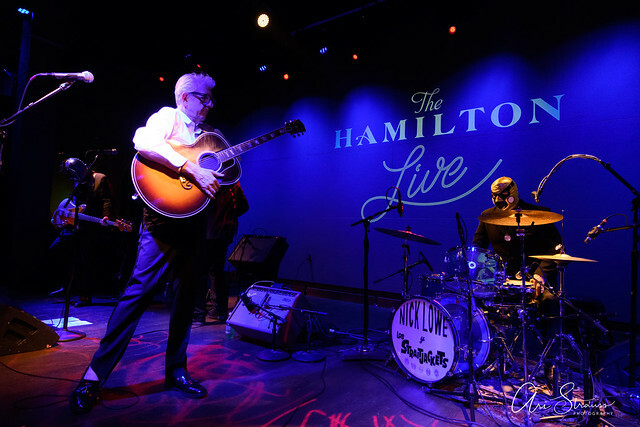 If you know Lowe, you know Nick is a seminal artist with multiple classic albums that range in style from pub rock to New Wave pop to roots rock to Americana. 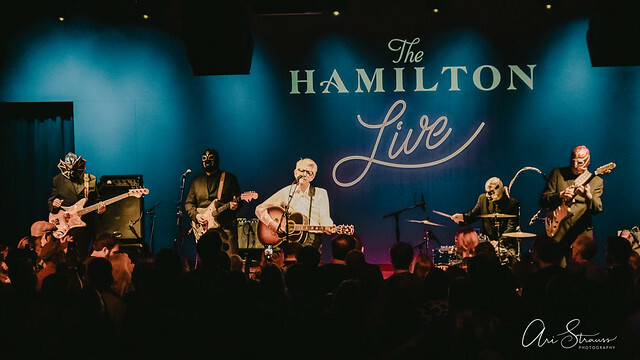 And even if you haven’t heard Nick’s songs before, they’re written with such strong hooks that you can often tell what they’re called without looking them up. 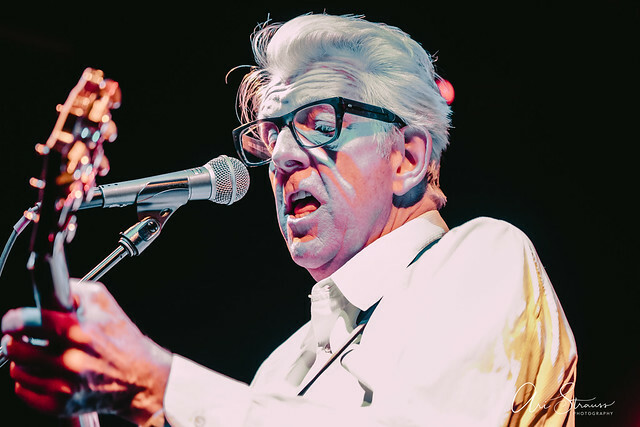 For this tour, the Quality Rock & Roll Revue, the fantastic surf/garage rock band Los Straitjackets backed him up. Los Straitjackets played to let the audience hear Nick’s words. Volume is to music as heat is to food, and rhythm is to music as flavor is to food. Good musicians realize that, just like food needs flavor with its kick, simply turning up the volume doesn’t make the sound better. It’s rhythm that makes sound into rock ‘n’ roll. 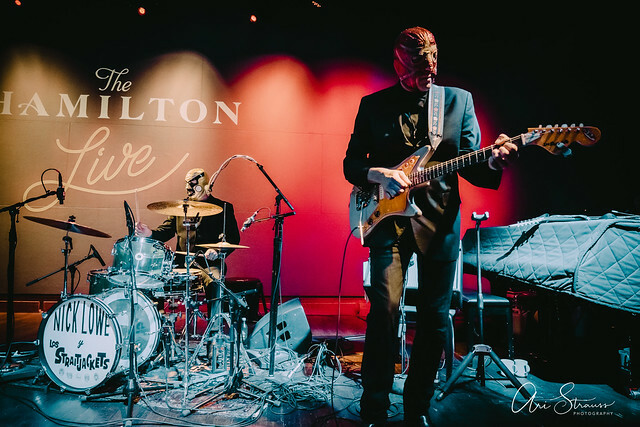 Los Straitjackets can play incredible rock ‘n’ roll music, and they’re better for the fact that they realize, working with Nick, that it’s the rhythm, the driving beat of their sound, that enhances the experience, as opposed to an absolutely crushing volume. 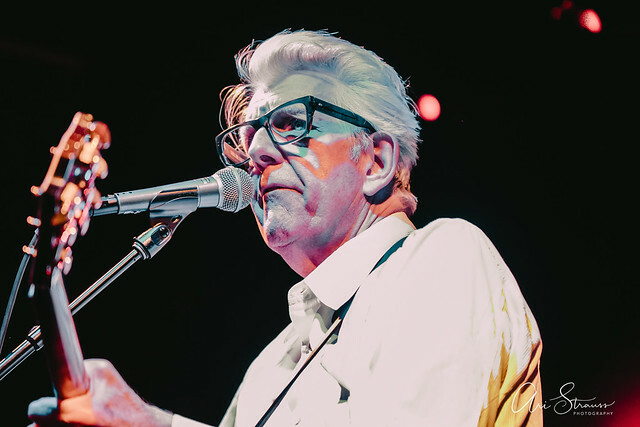 Nick and Los Straitjackets followed with “Ragin’ Eyes” from 1983’s Abominable Showman, then “Without Love,” from Nick’s sophomore solo album, 1979’s Labour of Lust. Labour of Lust, recorded with the backing of the superb bar band Rockpile, is considered at least as strong as Jesus of Cool. The album contains Nick’s biggest hit, “Cruel to Be Kind,” which he played after the interlude. 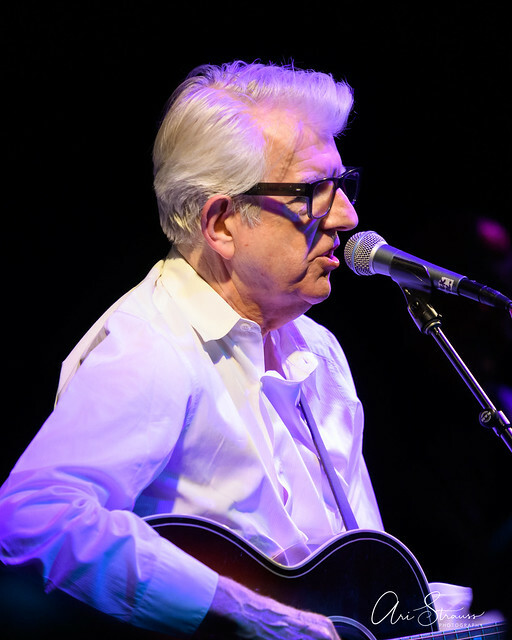 Nick played “Somebody Cares for Me,” from 2011’s the Old Magic, followed by the title track of the 2018 EP he made with Los Straitjackets, Tokyo Bay. He got the audience laughing by playing the opening hook of Tokyo Bay, stopping, and saying “thank you;” he then played the song for real. 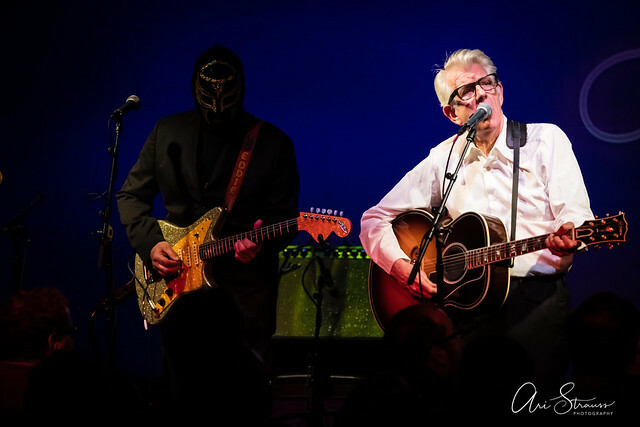 After Tokyo Bay, Nick left the stage, leaving Los Straitjackets to play a series of instrumentals. 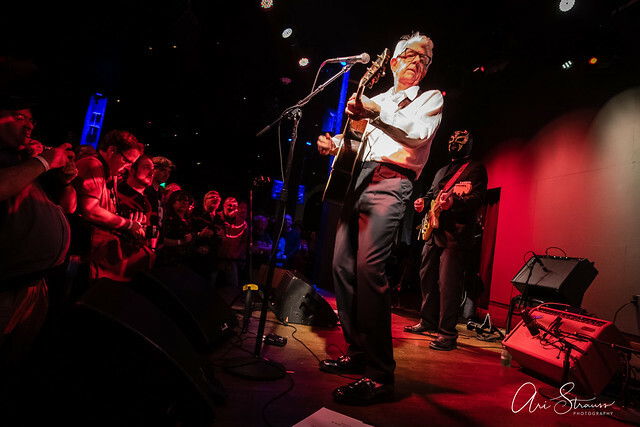 Los Straitjackets played five tunes: “Kawaga,” “University Blvd.,” “Space Mosquito,” “Itchy Chicken,” and a rocked-out “My Heart Will Go On.” “University Blvd.” refers, in fact, to the street in Takoma Park where lead guitarist Eddie Angel grew up. 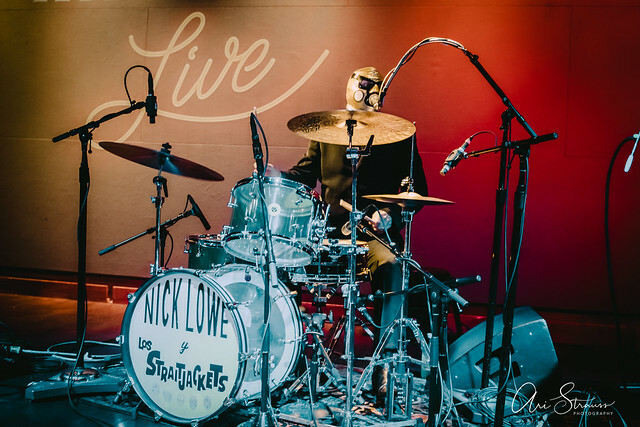 Los Straitjackets make an interesting complement to Nick. With their lucha libre masks and scattered phrases in memorized Spanish (they are not what you would call fluent speakers), they fit with Nick’s prominent sense of humor. And while Los Straitjackets have a gimmick, these guys can really play, and there’s more to what to do than just surf rock. Eddie has released a very well-received album covering the work of guitar pioneer Link Wray, famous for his instrumental “Rumble” and for inventing the power chord. 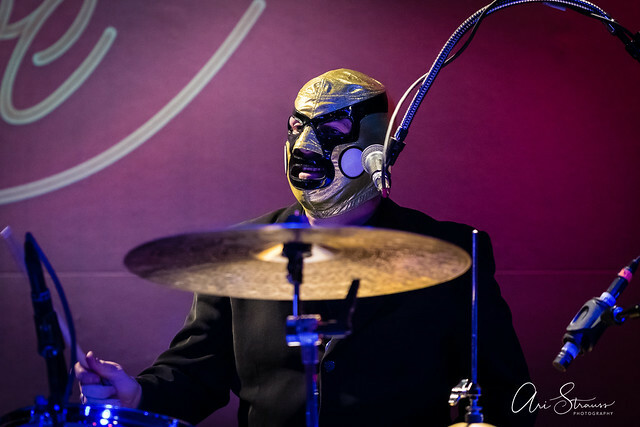 Los Straitjackets’ have as much garage as surf to their rock, and it’s a sound that really parties. 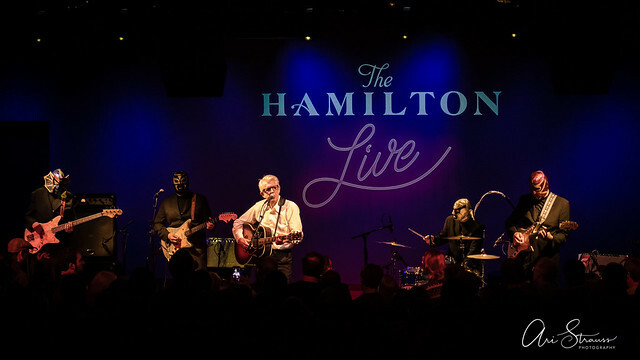 After the interlude, Nick came back wearing a change of outfit to play “Half a Boy and Half a Man,” followed a by a cover of the late country star Marty Robbins’ “You Don’t Owe Me A Thing.” After a couple of tracks from the forthcoming Love Starvation EP, mentioned above, came “Half a Boy and Half a Man,” from 1984’s Nick Lowe and His Cowboy Outfit.” Nick then covered “Here Comes That Feeling” by ’60s pop/country/rockabilly singer Brenda Lee, most famous for “Rockin’ Around the Christmas Tree.” Nick played a couple of cuts from his early solo albums, and finished the set with a Dave Edmunds cover, “I Knew the Bride (When She Used to Rock and Roll),” leading to thunderous applause. At the beginning of the encore, Los Straitjackets came out without Nick. I’m not entirely sure all of what they said, as my I’ve neglected my DuoLingo Spanish studies, but I know that they said “¡Viva Batman!” and I recognized the classic theme song from the campy ’60s TV series. (RIP, Adam West, you are missed, sir.) 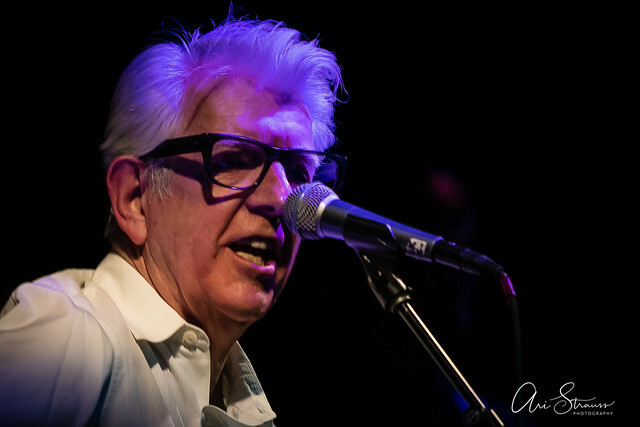 Nick returned to the stage and asked the audience, “How about a Rockpile song?” to introduce “When I Write the Book.” In something of a teaser, Nick and the band played an absolute classic tune from his Brinsley Schwarz days, “(What’s Funny ‘Bout) Peace, Love, and Understanding,” and everyone left the stage. 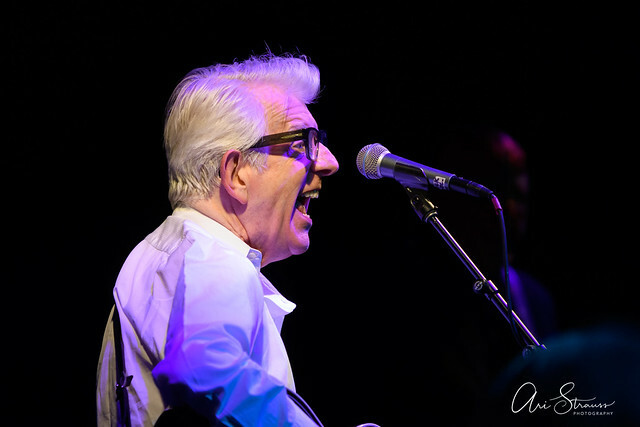 In a bit of reversal, after playing one of his songs that Elvis Costello made famous, Nick came to the stage alone and played Elvis’s “Alison” solo on the acoustic guitar. Nick played with veteran savvy, displayed his trademark humor, and lived up to his billing as the Jesus of Cool. 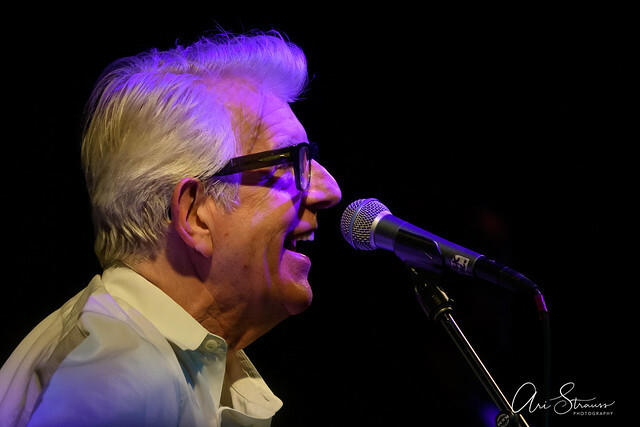 Nick just turned 70 a few weeks ago, but he sounds great and looks vigorous and healthy. He can still rock and roll more than most of the kids trying their hand at pop music today. 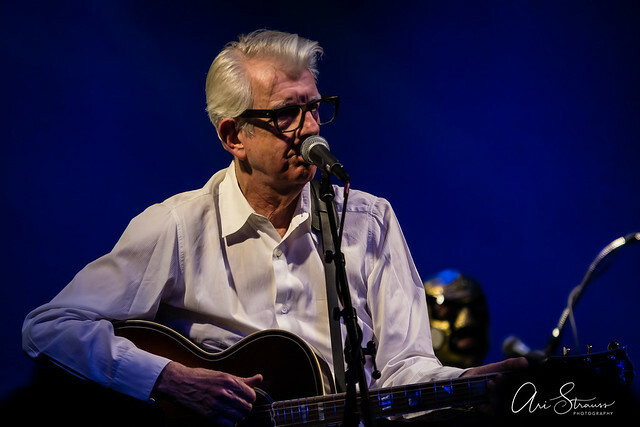 Here are some pictures of Nick Lowe and Los Straightjackets performing at The Hamilton Live on April 7, 2019. All photos copyright and courtesy of Ari Strauss.